MyHeritage is the leading destination for discovering, preserving and sharing family history. As technology thought leaders, MyHeritage is transforming family history into an activity that’s accessible and instantly rewarding. Its global user community enjoys access to a massive library of historical records, the most internationally diverse collection of family trees and ground-breaking search and matching technologies. Trusted by millions of families, MyHeritage provides an easy way to share family stories, past and present, and treasure them for generations to come. MyHeritage is available in 42 languages. Subscription plans: Basic (free), Premium, PremiumPlus, Data. Share family trees, photos, videos, events and messages. Connect and stay in touch with relatives, regardless of how far away they live. Privacy settings let you control how private or public your family site is. Create a Timeline, an interactive display of a person’s or family’s history. Read more in our blog. The Timebook is an automatically-generated digital scrapbook. Read more in our blog. 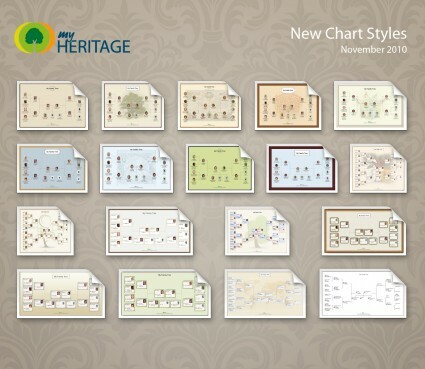 Create, share and print beautiful family tree charts. Read more in our blog. Personalized printed family calendars. Read more in our blog. Family Goals (group payments) – now the whole family can chip in for a subscription for Premium services. View a sample family site of the Kennedy’s or the Obama’s. Download our flyer with the key facts about our family sites (JPG, 291KB). Free software for Windows and Mac for building a family tree. Sync: Edit and access your family tree from your computer, online site, smart phone or tablet device. All additions and changes will sync in both directions between your computer and family site at MyHeritage. Read more on our blog. Record Matches: Advanced technology to match billions of historical records on MyHeritage to your family tree, opening the door for more research and discoveries. Read more on our blog. Unicode: Record data in any combination of languages and symbols. Family Tree Builder 7.0 supports 40 languages, including Chinese, Japanese, Korean and Farsi, now available for the first time. Maps: Stunning geographical displays of where your family came from or live today. Photo albums to organize media files of the whole family. Slideshow and screen saver to showcase your photo collections. Chart Wizard that will help you create stunning family tree charts in a few simple clicks. Fully customizable with dozens of different chart types and styles to choose from. Professional Printing Service – order any family tree chart to anywhere in the world. Tons of practical features to help you improve your research: Tree Consistency Checker, ’To-do’ lists, Custom Reports. 3 different calendars: Gregorian (standard), Hebrew, and French Revolution. 8 different reports: generate easy-to-read reports showing your ancestors, descendants, relationships, timelines, close families, and addresses. Scan your computer and directly import existing family tree data files from other genealogy programs. Better Family Site Integration:Many additional features were added in version 7.0, that are available from the ”Family site”. Family Statistics: MyHeritage analyzes your family tree and produces 45 enlightening statistics such as average lifespan and most common first names in your family. Profile pages: Profile Pages provide a beautiful consolidated display of any person in one page. They are instantly accessible from the Tree View. Family Timeline: See your family’s events and photos in an attractive, fun-to-use timeline. All your events, photos and videos that are dated will appear on the timeline. Family Timebook: The Timebook is an animated digital book of family photos, which includes automatically generated biographies for direct relatives. Family Events: Your family site is the best place to keep track of family events. See all upcoming family events in a list or monthly view. Now available for Mac users with Family Tree Builder Mac extenstion. 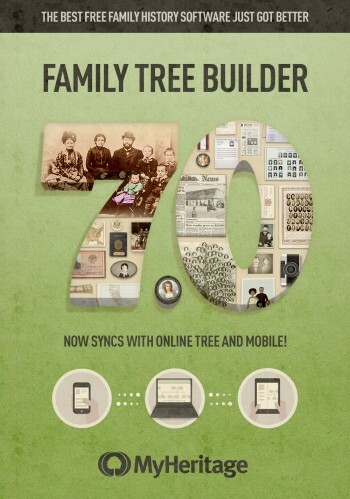 Download the Family Tree Builder 7.0 Software. Break through language barriers in family history research. Access historical records in any language translated into the language of query. Facilitate matches between names on family trees in different languages. Highly accurate technology that covers given names, surnames, synonyms and nicknames. Research and discover global roots by removing the obstacle of translating names from one language to another. Discover ancestors and create an online tree in seconds by entering just a little information. Add multiple individuals and photos to a family tree with just a few clicks. Instant matching with billions of family tree profiles and historical records. Highly accurate technology with almost no false positives. Provide users to progress from small tree seedlings, with only a handful of individuals, to large blooming trees with many branches, in just minutes. Emotional discoveries of passersby in New York and in London and Oslo. Mapped out real-time discoveries on MyHeritage from around the world. Learn more about Instant Discoveries™. First of its kind technology to automatically generate new leads and discoveries by turning a single record into a door to more. Records found in SuperSearch, our online record database, provide a summary to additional records and individuals in family trees relating to it. Provide users with new information and clues to take their research in new directions. Learn more about Record Detective. Compares each family tree to the millions of family trees contributed by other users, to find matches. Uses fuzzy logic to bridge across gaps of spelling, language and fact differences. Allows users to make new discoveries and reunite long lost family ties by harnessing the aggregate knowledge and data of the genealogy community. Includes advanced collaboration features to ensure family tree discoveries are made with confidence and are easily shared with family members. Video Interview by top genealogy blogger, Dear Myrtle, about Smart Matching. Learn more about Smart Matching. Billions of historical records including birth, marriage, death, burial, census, military, immigration, yearbooks, MyHeritage public family trees and the Geni.com world family tree. Contains the world’s largest collection of historical newspapers featuring over 120 million newspaper pages, dating back to 1609. Automatically finds relevant historical records for every family tree on MyHeritage. Constantly compares every family tree on MyHeritage to billions of historical records on SuperSearch. A Record Match is a document relevant to your family’s history, such as a birth record, a tombstone, or newspaper atricle. Record Matching is the world’s first and only technology to find family tree matches in newspaper articles, books and other free text documents, using semantic analysis. Record Matching is the first technology to translate names between languages, to find documents in languages other than that of your family tree to find documents in languages other than that of your family tree. Read more about Record Matches. Save records you discover in SuperSearch, our online search engine for billions of historical records, direct to relevant profiles in your family tree. Enhance your family tree by extracting information from the record and adding it to family tree profiles. Add historical records direct to your family tree and share them with your family. Read more about Save Records and Extract Info. MyHeritage offers simple, affordable and easy-to-use DNA home testing kits that can reveal valuable family history information and ethnic origins, and locate unknown relatives. Read more about DNA tests for genealogy. Face recognition technology and automatic photo tagging: tag a family member in one photo, and our tagger will recognize their face and tag them in all your photos automatically. Read more about Photo features in our blog. Now anyone can create, research, and edit their family tree on the go, capture family moments for future generations and stay in touch with their family anytime, anywhere. Your family tree like you’ve never seen it before – The MyHeritage app is a bespoke application for mobile devices using cutting-edge HTML5, and combines beautiful graphics and touch-screen gestures to create an experience that will impress your relatives and make you proud to display your family history. The mobile-friendly interface makes it easy to browse records on iPhone, iPad and Android devices, including birth, marriage, military, immigration, government, death, census and other historical records from around the world. Easy photo-sharing – Capture family moments as they happen, quickly share them with the people you love and automatically store them on your family site. Advanced face recognition technology identifies family members in the photo and effortlessly suggests sharing with them. To download the new app for free visit the App Store or Google Play where it was recently selected as a featured Android app. 29 August 2011: MyHeritage.com hits 800 million profiles and releases Family Graph API (as PDF. On Businesswire). 6 July 2011: MyHeritage.com Unveils World’s First Group Subscription Payments for Families (as PDF. On Businesswire). 7 June 2011: MyHeritage.com Acquires Bliscy.pl and Expands its Leadership in the Polish Family History Market (as PDF. On Businesswire). 24 February 2011: One in 20 Brits use MyHeritage.com as Online Family Network attracts UK Masses (as PDF). Business Insider 5 April 2012: Here Are The Census Entries of Iconic 1940s Celebrities Pascal Emmanuel Gobry. Busines Insider 23 November 2011: MyHeritage Parachutes In The Backyard Of Its Billion-Dollar Competitor With New Acquisition Pascal-Emmanuel Gobry. TechCrunch, 21 November 2011: Social Network For Families MyHeritage Furthers U.S. Presence With Acquisition Of FamilyLink. Leena Rao. TechCrunch, 20 September 2011: MyHeritage acquires family tree backup service BackupMyTree. Robin Wauters. Business Insider, 7 September 2011: 20 hot international start-ups you need to watch. TechCrunch, 26 August 2011: Build an app for MyHeritage and win $10,000. Sarah Lacy. The Daily Telegraph, 21 July 2011: Israel – The start up nation taking on Silicon Valley. Emma Barnett. Business Insider, 19 July 2011: This company is seizing the huge social opportunity that Facebook and Twitter missed. Pascal-Emmanuel Gobry. Business Insider, 18 July 2011: How a startup no one would touch crushed silicon valley moguls and became a giant. Pascal-Emmanuel Gobry. Business Insider, 7 July 2011: This Company may have cracked the code on social payments. Pascal-Emmanuel Gobry. AllThingsD, 5 July 2011: Family site makes paying for subscriptions social. Liz Gannes. Techcrunch.com,2 February 2010. MyHeritage Acquires OSN. MyHeritage Buys Germany’s OSN, Now 540 Million Profiles Strong. Thenextweb, 13 August 2009. MyHeritage Releases New Version of Family Tree Builder. Ayelet Noff. Social Media Biz, including interview with MyHeritage.com Director of Marketing Mario F. Ruckh. 13 August 2009.MyHeritage Updates its Family Tree Builder. Ayelet Noff. Examiner.com, July 2009. MyHeritage helps unite families worldwide. Shannon Hollifield. TechCrunch, April 2009. MyHeritage: Avoiding the Metacafe Curse. Sarah Lacy. Ancestry Magazine, March 2009. Can the Latest Tech, Tools, and Trends Help You Do Your Genealogy? Kelly Burgess. Times Online, Jan 2009. Using the web to hunt down your family tree. Murad Ahmed. Babble, Jan 2009. Look-Alike Meter’s Busting Family Fights. Jeanne Sager. Guardian, Nov 2008. Genealogy website MyHeritage offers low-cost DNA tests. Jemima Kiss. Mashable, Nov 2008. 35+ Sites Made for Web-Savvy Families. Doriano Carta. Winner of GenSoftReviews 2014 User Choice Awards for Family Tree Builder and Website. Named one of Best Genealogy Websites of 2014 and Best Big Genealogy Websites of 2014, by Family Tree Magazine, 2014. Ranked the #10 fastest growing company in Europe, The Middle East, and Africa in the Deloitte Technology Fast 500 EMEA for 2013. Ranked #3 in Deloitte’s Israel Technology Fast 50 for 2013. Voted a Top Website for sharing and storing family research by Family Tree Magazine, 2011. Named one of the 10 best web sites for storing and sharing family history and photos, by Family Tree Magazine, 2009. Ranked the #2 most popular genealogy site by ProGenealogists in 2011 and the #3 in 2009 and 2010. Recipient of the 2010 User Choice Awards by GenSoftReviews for best genealogy software. MyHeritage mobile app featured on Google Play in March 2015. Ranked #5 in Top 100 Genealogy Websites of 2015 by Genealogy in Time Magazine. ”Family Tree Builder wraps up a powerful set of features in a beautifully designed and user-friendly interface”. Nick Peers.” Family Tree Builder 5.1. PC &Tech Authority, Australia, May 2011. Bandy, Tony. New mand Improved: Family Tree Builder. Family Chronicle Magazine, Canada, May 2010. P 6-9. Amsel – Arieli, Melody. MyHeritage – our future. Ancestors Magazine, UK, March 2010. P 58-59. Taylor, James. Family Tree Builder 4.0. Family Tree Magazine, US, February 2010. P 80. Williams, Wayne. Advanced genealogy tips. Web User Magazine, UK, June 2009. P 36-37. USA, Germany and Poland: Michigan based user discovers long-lost relatives – near and far! USA: MyHeritage helps Wanda build a 20,000 people family tree! Israel, Australia, USA, Austria, Hungary, Slovakia: The Frankl family gets reunited through MyHeritage! USA and Germany. World War II Child Discovers Secret Ancestry. To find all the users stories see our blog’s category ”user story” and our user story website. Founded in November 2005, MyHeritage has raised a total of $49 million, initially from business angels and later from some of the world’s foremost venture capital firms. In the summer of 2008, the company raised $15 million from Index Ventures, investors of Skype, and Accel Partners, investors of Facebook. In November 2012, the company raised $25 million from a funding round led by Bessemer Venture Partners (BVP), (who have invested in major companies, from LinkedIn to Pinterest, Staples to Skype, VeriSign to Yelp) and included existing investors, Index Ventures and Accel Partners. In 2007, MyHeritage acquired Pearl Street Software, a leader in genealogy software programs based in Colorado, USA. In 2008, MyHeritage acquired Kindo.com, a family social networking site from London. In 2010, MyHeritage acquired OSN (Verwandt.de), a family social networking popular in Europe that was operating from Germany. In 2010, MyHeritage. acquired the Dutch family network ZOOOF.com. In June 2011, MyHeritage acquired Polish family network, Bliscy.pl. In November 2011, MyHeritage acquired www.familylink.com and www.worldvitalrecords.com. To view a high resolution version of a picture click on it, then download it by right-click and ”save as”. Subscribe to the MyHeritage YouTube channel to stay up to date about new videos! If you want to embed this video, you can find the code for it here on YouTube. Intro: NEW: MyHeritage DNA tests for genealogy!